Today, November 17, would’ve been my maternal grandmother, Jeannette Marion’s birthday. We are all part of those who’ve come before us. How many times have you seen those commercials on television or posts on Facebook discussing the benefits of having your DNA tested to determine your ancestry? I particularly like the one we see on occasion in Canada where the elderly father has always believed himself to be Scottish and serves his grandchildren haggis for dinner. The son questions his father’s assertions, and lo and behold, he does an ancestry search and discovers the family isn’t Scottish at all, but Italian. I’ve always believed I knew exactly who I was and where I came from. I was French-Canadian, and one of my cousins had actually traced our ancestry on my father’s side, all the way back to Paris in 1660. 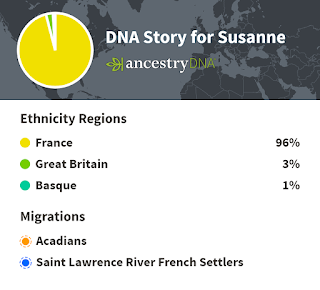 I wasn’t as certain about where and when my mother’s side had come to Canada, but since they were even more French than my Dad’s family, it was a given, I was French. Out of curiosity, I decided to see if I could narrow that down a bit by having my DNA tested, just to prove to myself that I knew what was what. I ordered the kit online, spit into the small container, and sent it off to be tested. When the results came back, I was stunned. They weren’t at all what I was expecting, very broad in range and scope, but recently, the testing program has been updated and the revised DNA results were exactly what I’d expected, with a surprise or two thrown in. 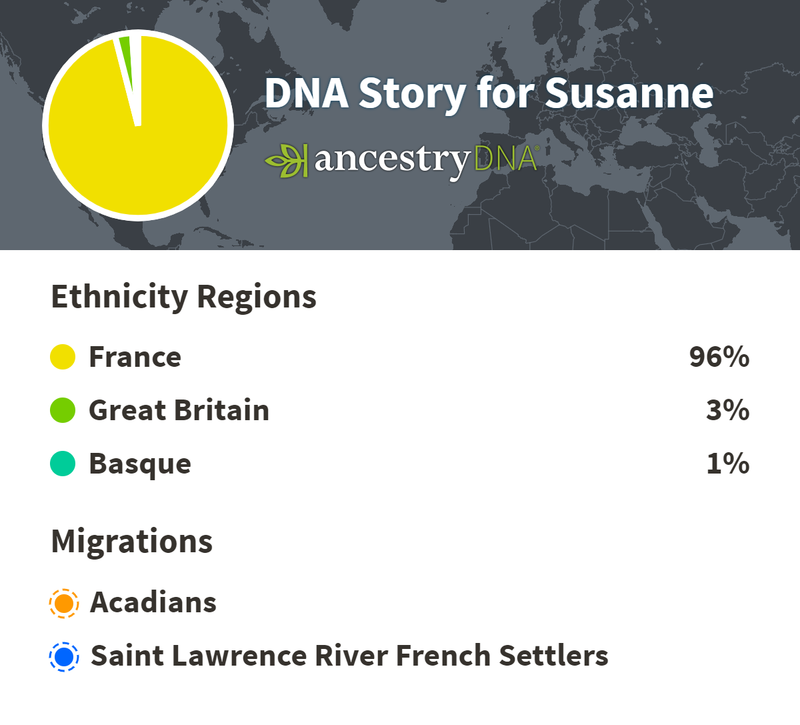 My DNA indicated I was indeed French—96% so—but the stunner was that I was 3% Great Britain and 1% Basque. The other thing the test showed was that my family had come to Canada and arrived in two different places—along the St. Lawrence River as settlers as I knew, but what had to have been my mother’s family settled in the Maritimes and were among the original Acadians, the people deported to Louisiana in the mid-seventeen hundreds. There was another surprise in there for me when I mentioned this to my mother. She said something to the effect of “I knew that. We came from the States, South Carolina, I think through the colonel. Well, it seems I had an ancestor who may have fought for Washington’s Revolutionary Army. Was he the 1% Basque or the 3% Great Britain, or could he have been one of the Huguenots in France, fleeing religious persecution? Those secrets are yet to be discovered. What secrets may be hiding in your DNA? So, what does this all have to do with a Christmas romantic suspense novel? Think of that 3% because it could have a huge impact on someone who didn’t know it existed. The idea for Murder & Mistletoe came from that DNA test and events that have made the news in the last year or so about people still ready to fight the Civil War 160 years later. Imagine a powerful family divided over it, with one son fighting for the North while the rest of the family supported the South. Now, after decades of being apart, a missing heir who happens to have 3% Senegambian blood is discovered. Not everyone will be ready to accept her into the family, especially not the cousin with ties to a white supremacy group, who’s been searching for the family founder’s missing treasure. When you combine greed and lost pirate treasure, you have a sure fire recipe for murder. 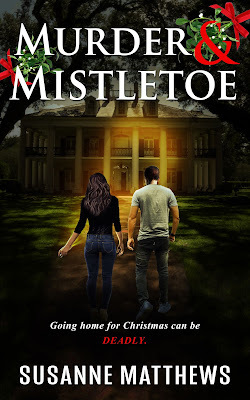 Murder & Mistletoe is available for pre-order. The book will be released November 21, 2018.